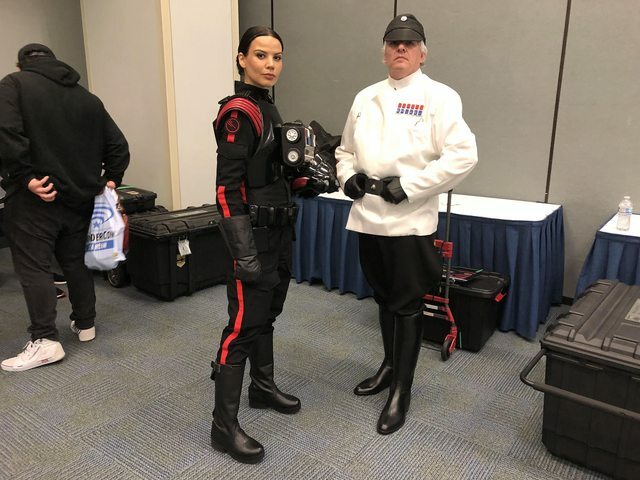 So, I did some digging on the Imperial Officer forums, and there has been some discussion on this character but not much action. 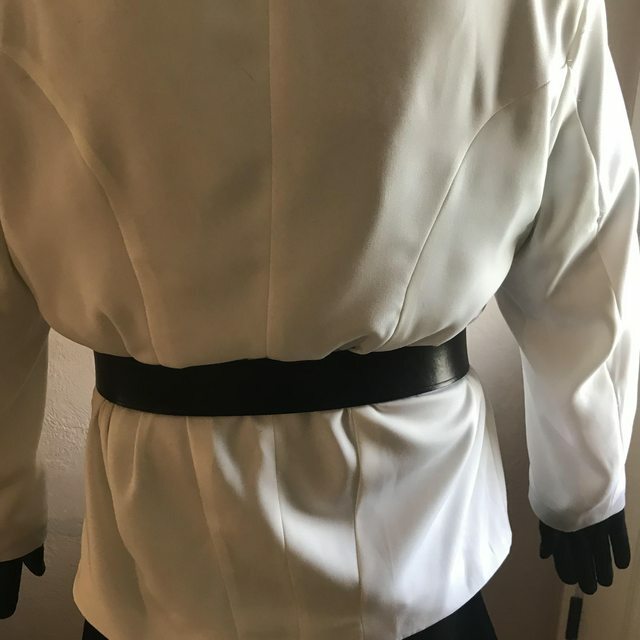 I am working with CosplaySky on the properly modified white tunic with a fusion of standard and ISB style cues in his tunic. Specifically, while the yoke is cut in the ISB style, the yoke is also not as wide so it reveals the right side pocket and it also has a left side pocket. 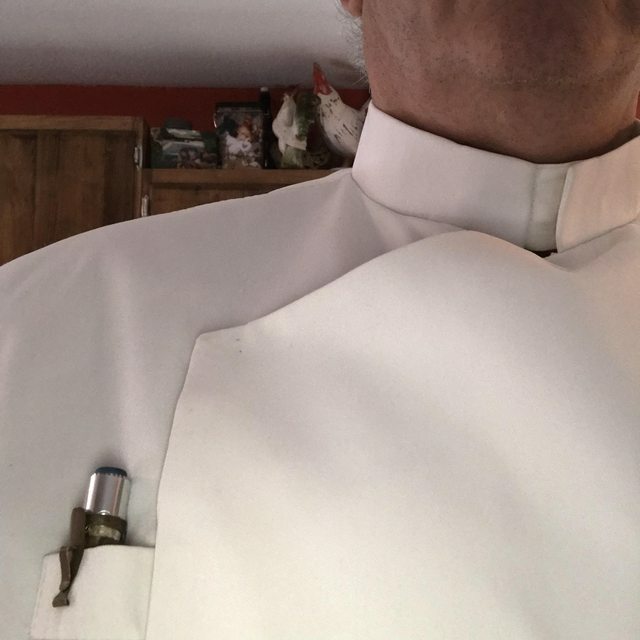 ISB tunics do not have the pockets. Otherwise, it will be the same as a standard black tunic with the yoke cut differently. It will not go up to the right shoulder. Picture from game for reference. I'm ordering a couple of extra yards of trouser material for a hat or 2 to be constructed likely by Tigg-Wolf, who is also making the rank bars. His belt buckle is flat not curved, but if my current curved buckle belt from Brian Pfau will pass for basic approval, I will stick with that for now. Need gloves and boots still but this will come together fairly quickly, and if it looks good enough, maybe I can be the CRL model? Tunic and trousers ordered, along with 2 yards of material for hats. One with the notch up, one with the notch down as my current hat has seen better days. Hopefully they understand what I want. ISB tunic does not have pockets, and yoke extends further across the chest from left to right. Hopefully it will be close, I did send them my measurements and custom fitting charge. Last item for possible basic approval based on preliminary CRL is the boots. Found some on the interwebs but calf diameter too small for me, and I don't have monster calfs (spelling???) so that search will continue. Cosplaysky completed the order, awaiting full shipping information. Hopefully they looked at the photo I linked them to with my custom order, hopefully no alterations needed. Ordered boots, will be here Thursday. Would be nice if I got to try it all on this weekend along with some Inferno Squad peeps at Evergreen, but there's no way it will get here that fast. Boots arrive Thursday, costume Friday. Wish rank bars would be here by then. We'll have to see how they did on the tunic. Looks like boots and costume will both arrive today. I have added a "kid's size" set of rank bars to my order. After watching the cutscenes featuring AD. 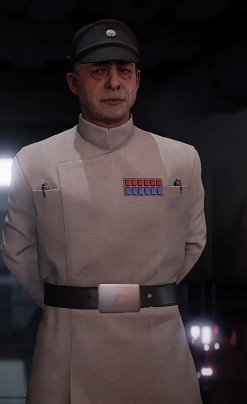 Versio, it is pretty clear to me that his rank bars are smaller than the lower ranking officers that are on the Star Destroyer with him. I have both full size and the 3/4 kid size for comparison. We'll see how the tunic looks later today I think. More to come. 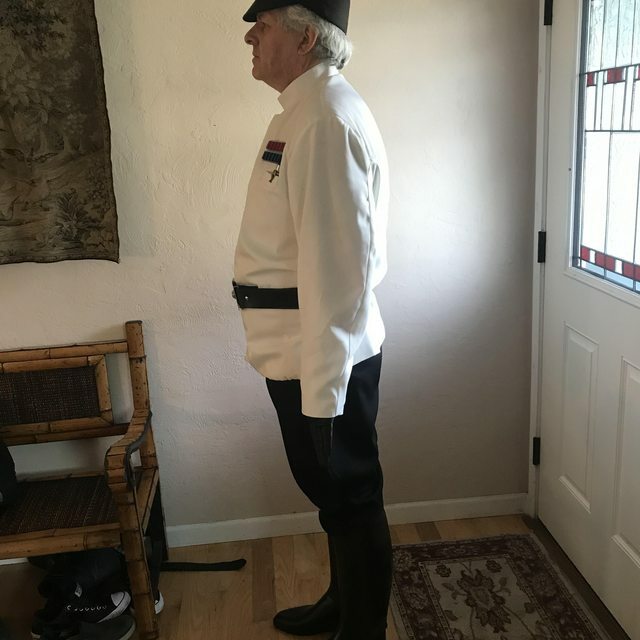 I received my tunic and trousers, both need work before submission. 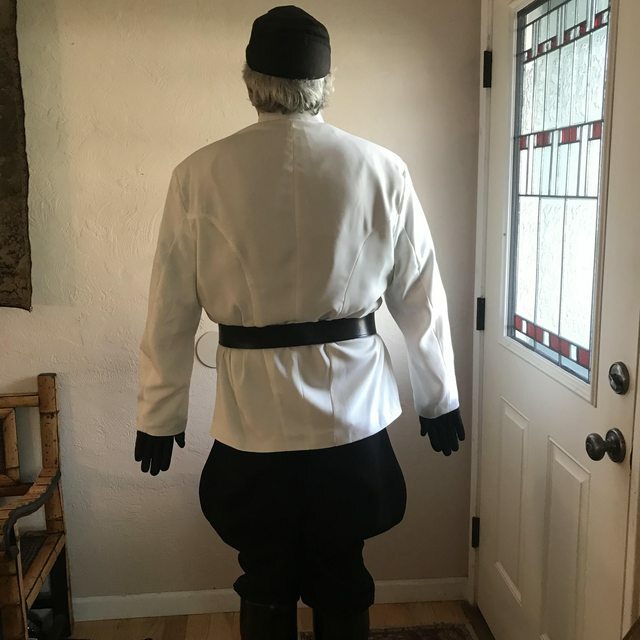 Thanks to Sierra for being awesome and helping my with adjustments to both the tunic and the trousers, despite sending my measurements the pants are so big they fall off. Boots are tight but doable. Thanks also to Casey (Yesac) who has generously found time to craft me a couple of new hats with the extra trouser material I ordered. Material goes in the post today. I think we will be able to make a CRL from this once it is completed. Ordered the wrist length gloves I think will work. Hopefully hat was able to get finished over the last weekend. Gloves have arrived, tunic and trousers should be done today. I notice my belt buckle needs polishing and the correct rank bars have not arrived yet, and awaiting word on my hat. Will take pics of the WIP so far with my old tired hat and incorrect rank bars, overlook those and we will be comparing the rest to the available screenshots. Tunic and trousers are getting picked up tonight. Rank bar arrived late last week, just need a new hat which is in progress. Boots tight but OK for now. GIO (Crowprops) English real leather riding boots are in my future. I will post some pictures with everything including my old tired crappy hat in the next couple of days. Ok, no pics yet but close. Hat is completed, thank you Casey!! Found time to finish one yesterday that I could pick up on my way back from a meeting in Salem. Needs a greeblie, Casey couldn't find the couple that he thought he had lying around. Call went out on facebook playground forum for one or two that I could purchase locally. Tunic and trousers are finished, now to make sure it all fits. Tailoring of tunic and trousers should be all done, need to try it all on. Boots barely adequate but will order custom Gio Crowprops boots for more comfort. Now to try it all on and post some pics. OK, other than the hat, this is what I have. 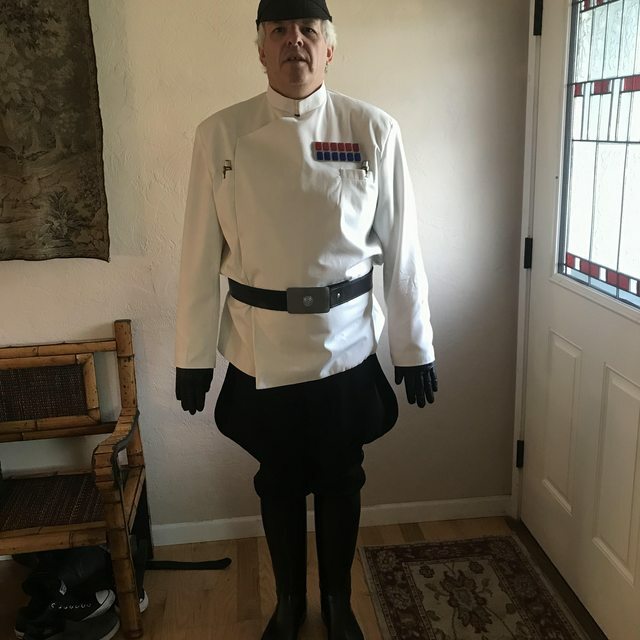 I have posted them on the Imperial Officer forums, we'll see what the experts have to say. Yoke area not the same as regular Intelligence division and it has pockets regular ID does not. The Empire thanks you for your cooperation. Thank you Sierra for all the work on both the trousers and tunic! Going to move the clasp for the yoke next to the pocket slightly to make the yoke lay more flat. Took some of the excess off my belt, with my weight loss and added a new hole to make it fit more snugly. A good problem to have, actually. 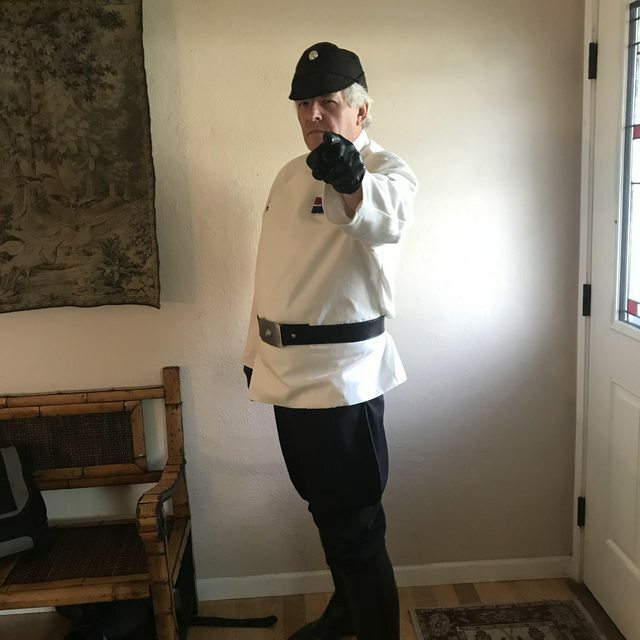 Went to LA to play for the weekend, did a day at WonderCon and debuted my Admiral Versio with a bad hat and work still needed on the tunic. Nothing official since it's not approved yet.